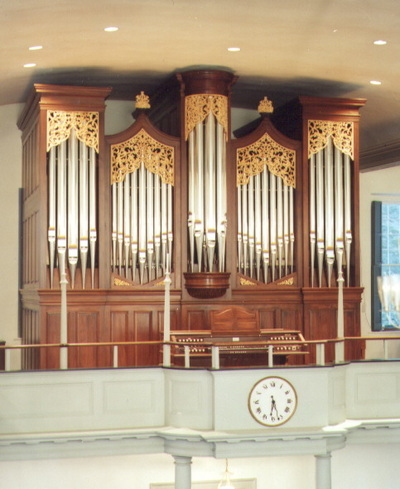 Prior to the installation of the church’s first pipe organ, congregational singing and chanting of psalms was unaccompanied or supported by a string instrument. In 1817, Jacob Hilbus and Henry Harrison of Washington, DC built and installed the church’s first organ. This organ was destroyed in the 1835 fire and was replaced in 1849 by an organ built by Henry Erben of New York City, which was installed in the apse behind the pulpit. This organ was relocated to the rear balcony in 1927. The Reuter Organ Company of Lawrence, Kansas installed an organ on either side of the Erben in 1965. In 1997, the Erben organ was returned to its original location in the apse, the Reuter organ was donated to a local congregation, and a new instrument by Lively-Fulcher Organ Builders was installed in the rear balcony.